Testimonials about QuestTreks.com - Quest Tours and Treks Inc.
"Thank you for bringing "trips" back to Salemtowne!" As Ollie used to say, “Well, you’ve done it this time, Stanley.” And you did it this time, too, Sylvia. Our trip to Portland was one of the best I’ve been on. Not only was the bus ride smooth and comfortable and the driver congenial, but you made sure we had everything we needed for our comfort. I’ve never had bottled water before on any other trip --and even the trail mix hit the spot. I was impressed with how well you organized the trip--and the little token as we left the bus was a nice gesture. Your future itinerary sounds great. Thanks again for a really nice day. As an old State bureaucrat, I was impressed with your organization and hard work. You do an excellent job and have earned the right to succeed. I had a good feeling when you presented your proposal for Quest Day Tours. I took the first trip offered and every one after that the first year. I’m always looking forward to the next one. Thanks for the thoughtfulness, good planning, site locations and extras you put into these trips. After visiting the listed destinations, I start anticipating what the extras you plan will be. You always offer us something of interest, commentary on what we are seeing, and great food - whether a catered picnic or elegant lunch site you've selected! 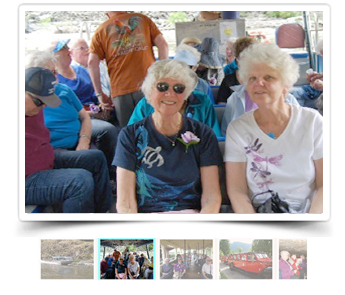 I have taken tours with Quest Tours & Treks for over a year and have always been satisfied. Sylvia plans each trip thoroughly and includes places of interest along the way. She gives us background information that makes the trip more interesting. Also, I appreciate the way she gives attention to details, and to each person in the group. The food and overnight accommodations are first class. I highly recommend Quest Tours & Treks. I LOVE TO TRAVEL - I have been on several tours with Quest Tours & Treks. They have been great. Sylvia is a terrific Tour Operator, she always gives that extra to make the trips fun and she works hard to cover all the details. I’m looking forward to the next trip! I enjoyed your Leavenworth Holiday deLights tour so much last year that I’m signing up to go there with you again this year and bringing others with me! Highlights of the trip, including the charming Bavarian town with all its lights, and the sleigh ride through the woods, delighted us all. I’m looking forward to joining you again for the 2004 tour. I enjoy my tours with Quest Tours & Treks because I can always expect the unexpected - an extra touch here, a surprise stop there! I'm looking forward to our trip to Branson, Missouri in November. I know this holiday trip will be grand!